Please give Camille Griep a warm welcome! Her new book, New Charity Blues, came out recently, and she stopped by to chat about it, and more! 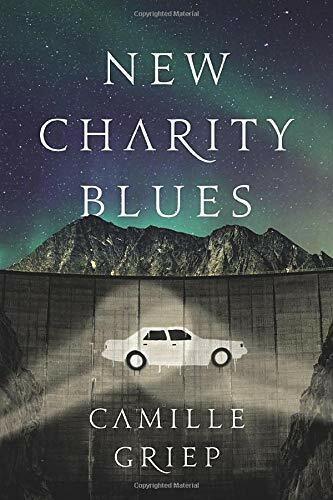 Will you tell us a bit about New Charity Blues and what inspired you to write it? I’ve always been fascinated with the character of Cressyda. And especially as I started writing about the many facets of womanhood, I kept coming back to her story. Was Cressyda, as Shakespeare asserts, disloyal and fickle – a trollope, or was she simply trying to find her way out of a desperate situation, looked upon as a traitor by all sides and abandoned by a persistent wooer she tried to resist falling in love with? I wanted to give Cressyda a voice, an opportunity to show the story of her arrival in Troy, how torn she was between Troilus and her responsibilities as a woman, and how betrayed she felt being traded back to the Greeks as chattel. Troy accuses her of infidelity as she makes friends with the men in the Greek camp, but my modern sensibilities ask what was she supposed to do? I argue Syd was brave, not inconstant, and I wanted to work that angle from a contemporary viewpoint. Meanwhile, there’s Cassandra, Troilus’s sister, who everyone dismisses as “crazy.” It’s a characterization fraught with dismissive, anti-feminine hysteria. She could see the train wreck coming from a mile away – her desperation, even as she tried to warn Troy, must have been horrifying. How would these women have interacted as friends, as sisters-in-law? What did they want? Could Cas have loved Syd as a friend and still worried over the destruction Syd’s actions might cause Troy? There was so much to explore in just this tiny microcosm of two communities, two women, and I couldn’t stop writing once I got started. Most of my research involved re-reading the Greek and Shakespearean narratives. Because I used both as reference points, true scholars of the Trojan War will find the story amalgamated to my needs. Characters were rolled together for the readers’ sanity and the scale of time was truncated. Conversely, the elements needed to tell the women’s stories were accentuated, and I hope it explores what the war might have looked like from their perspectives. I also did a lot of research on water – the reservoir and the hydroelectric dam being such a large part of the main, external conflict. I did far more research than made it into the book in the end. Because it’s not a particularly scientific sort of post-apocalyptic fiction, we tried to scale back much of the exposition about the water system itself, though there are plots and plans and drawings sitting around in notebooks on my desk. I also did a fair amount of reading on crops and agriculture – what does a desert that is suddenly turned into a wetland support? Could one grow southern crops in the north, with enough water? Some of what I’d planned was possible, other pieces had to be scrapped. Finally, I can tell you I know a lot more about a Toyota Cressida than I ever thought I’d know. I did research on how to hotwire a Cressida, how much it weighs, the types of transmission, size of engine, and how much tinkering one could do to turn it into a rugged, all-terrain sort of vehicle. Much like Syd, it turns out, they were more dependable cars than their name implied. Why will readers root for Syd? What makes her a compelling character? Syd is the sort of girl who had everything figured out. She gave her entire childhood to the pursuit of a dance career, which isn’t all that uncommon for dedicated dancers, (though I left some ambiguity over how much of that was her dream and how much of it was her mother’s.) It’s also not uncommon for girls to have their dance dream halted prematurely, through injury or the simple fact that there are more dancers than jobs. This happens to Syd with the devastation of the City, with added insult that her entire career is rendered superfluous. Who has time to make art when survival is at stake? Having no idea what to do with herself, she tries to be useful. She befriends her neighbor and hunts for books for the library. She makes candles. After her best friend dies, she tries her hand at medical work. Syd is the lost part of all of us, the part that yearns to make something lasting, to do anything meaningful. Syd is used to being seen, but wants to be heard. Syd is used to being alone and doing everything by herself. Loss upon loss have made her self-sufficient, a little careless, and ever-so-slightly arrogant. When she lands in New Charity, I think readers will be rooting for her to take the hands extended to her before she destroys everything that’s left to love her. Will you tell us more about Cas? Cas, a Seer in the tranquil town of New Charity, is in every way her childhood best friend Syd’s opposite. Physically, Cas is fair and strong, where Syd is dark and lithe. She’s used to people listening to her, but she wants to be seen as her own person, not just as the voice of the Sanctuary. Her battle starts at home with her mother, who still treats Cas like a little girl instead of a young woman. In some ways, it’s easier for Cas to exist in this space, to keep the peace, to keep from making decisions. But she’s forced into making them – not just via Syd’s arrival, but also due to her changing relationship with her twin, Len. As Len leaps into the coming-of-age chaos that comprises finding oneself, Cas finds herself truly alone for the first time. And she’s terrified. Cas doesn’t know what sort of life she wants for herself, but she knows it isn’t the one her mother has mapped out for her. She doesn’t want to lead the life of Len’s hijinks, either. At first, Syd’s arrival looks like at least an interesting sort of distraction, but once Cas is saddled with frightening information about Syd’s father’s death, she doesn’t know what to tell and what to keep to herself. Second guessing herself puts her friends and family in danger, and, above all, herself. As her choices leave her more and more isolated, I hope readers will root for Cas to find the strength within herself to become the adult she wants so badly to be. Have you always wanted to be a writer? Will you tell us more about yourself and that progression? I grew up in the wilds of Eastern Montana in my grandparent’s house. It was the sort of childhood where you could run away for a day and no one would notice. Not to say there wasn’t a lot of love, but there was even more freedom. When I wasn’t riding somewhere on my horse, I was camped out in my very own Bramble House, a collection of juniper trees that formed a two-room clubhouse in the ravine behind our barn. I was alone a lot and had a vivid imagination. I invaded the library early on, finding solace in books during a particularly long and stubborn bout of childhood insomnia. When I’d exhausted the section of shelves I’d been told I could read, I started in on the other shelves. Around the same time, my school started their young authors program. I wanted to be a great many things as a kid, but author was always in there somewhere. I wrote and wrote, filling journals and notebooks and folders. I turned my sights to journalism in high school and college, though I concentrated on poetry as an undergrad. When I found myself ejected into the real world, my saving grace was my ability to write. I wrote my way through careers in marketing and real estate, risk management and finance, until one day, the voices inside demanded I give them a chance to be center stage. What’s one of the first things you remember writing? My first book, Melinda Morgan, was written for school. I bound it in a lilac colored fabric and illustrated it with colored pencils. The story concerned a young Texan named Melinda who plotted alongside her sister to secure herself a horse, one who is later revealed to be a Pegasus. “She had many exciting adventures with him.” Sadly, things didn’t end very well for Melinda, as she and her trusty steed were eaten by a peckish, green dragon. There were countless stories after that. There were characters inspired by my friends and my favorite rock bands. I wrote everything from mystery to romance, from comedy to a paean to Julie of the Wolves, illustrated with found objects. The latter won a blue ribbon at the state fair. What authors have influenced you the most, in your writing, and in life? This is such a hard question because I feel like a sponge: almost every book I touch and every writer I meet influences me in some way, sometimes big and sometimes small. But I’ll take a swack at answering, at the risk of leaving someone out. Prior to, say, age 25 (let’s call that “early in life”), I was influenced by the works of C.S. Lewis, Farley Mowat, Willa Cather, and Rudyard Kipling. I was a devotee of A.A. Milne and fairy tales of all kinds – we had books of Russian, Norwegian, and Chinese fairy tales in addition to Grimm and Hans Christian Anderson. I will admit to tearing through the Sweet Valley High and Babysitter’s Club series of books, too, but not without a healthy dose of Nancy Drew and the Boxcar Children to follow them up. There were a lot of nameless ‘50s novels, too, which didn’t do a great job of setting up a realistic perspective on ‘80s romance, if I may say. In college I fell hard for poetry and, for a while, even had designs of trying to join the poetic ranks. I buried myself in Robert Frost, Robinson Jeffers, and Sylvia Plath. I adored Adrienne Rich, Virginia Hamilton Adair, Dorianne Laux, Wendy Cope, Billy Collins, Steve Kowit, Donald Hall, W. S. Merwin, Czelaw Milosz, and Robert Pinsky. At Claremont McKenna I was fortunate to get to meet and take classes with many of them. They still inspire my work today, though from a respectful distance. More recently, I’ve been studying the work of Walter Moers, an eccentric German writer whose whimsical The Thirteen and a Half Lives of Captain Bluebear is everything satire and ode and silliness all at once. He writes with abandon, which is something I’m working on. Edith Pattou’s splendid middle grade work East is a retelling of East of the Sun, West of the Moon and is so beautifully done that it should be a manual for anyone venturing into the world of telling old tales. Libba Bray’s books are full of bright colors while hewing to timely truths. Pamela Ribon writes contemporary women with wit and heart. Brendan Constantine is a poet whose work consistently slays and inspires me. I could go on and on for pages, but suffice it to say, I try to ingest twice what I output; reading is integral to writing well. The Horse and His Boy by C.S. Lewis. If any book is responsible for steering me toward a fantasy bent, it’s this one. I must have spent years trying to get my own horse to talk to me, and here, in this book, the horse not only spoke, but had a hilarious personality, perpetually flummoxed by the shiftless boy-hero, Shasta. I followed my grandparents around, demanding they listen to this passage or that. I mean, a talking horse! Where had these stories been all my life? And why weren’t there more? Have you read any good books lately? Anything you’d recommend? I’ve read a ton of good books in the last several months. I had a bout of illness earlier in the year that gave me plenty of time to catch up on my reading list, though it is, truthfully, still an unmanageable length. N.K. Jemisin’s The Fifth Season is hard to talk about without spoiling. But Jemisin does a brilliant job of writing women who are powerful, flawed, challenged, and triumphant all at once. Additionally, she’s created a huge world with a multitude of (sometimes literally) moving parts. I can’t wait to see what’s next. Vermillion, by Molly Tanzer, is a highly entertaining hybrid of fantasy meets historical fiction meets Western meets Lou Merriwether, a gender fluid psychopomp who struggles with her half-Asian heritage even as she delves into the mystery of missing Chinese railroad workers. This book has it all: rich humor, unrequited love, and talking bears. Normally I don’t allow myself to read within the genre I’m writing, so I couldn’t wait to start Madeline Miller’s debut novel, Song of Achilles, once I was finished and had turned in my latest book. Focusing on the relationship between Achilles and Patroclus, this lyric love story is soul rending. The story itself is beautifully sad and carefully rendered, but her prose is perfection. Not a word wasted, never a sentence out of place. I’m currently reading One Night in Sixes by Arianne “Tex” Thompson, who I met last fall at World Fantasy in Saratoga Springs, NY. Sometimes when you meet an author you just know you’ll love their work. Thompson’s narrative, like her, is warm and funny, but is also a tightly told Western with characters you can really sink your teeth into. Next up, I’m tackling another stand-alone project involving the fairy tale trope “Love Like Salt,” sky deities, and some weather magic. It’s a story I’m striving to let myself sink into, which is hard for all of us writers who live out here in the real, distraction-filled world. It’s easy for me to let everything from editing work to grocery shopping pull me away from my desk, but this tale is demanding immersion and it’s been a great luxury to relent. I hope readers will come along with me to this as-yet-unexplored, new world. In the wake of a devastating plague, two communities emerge as bastions of survival. One is called the City, and its people scrabble for scraps in the wasteland. The other, New Charity, enjoys the bounty of its hydroelectric dam and refuses City denizens so much as a drop of precious water. When City-dweller Cressyda inherits her father’s ranch within New Charity, she becomes intent on opening the dam to all—no matter the cost. But when Syd reunites with her old best friend, Casandra, a born seer and religious acolyte, she realizes that her plans could destroy the fragile lives they’ve built in order to survive. What’s more, the strange magic securing the dam’s operations could prove deadly if disturbed. Yet when Syd discovers evidence that her father might have been murdered, she is more determined than ever to exact revenge on New Charity’s corrupt. Pitted against Cas, as well as her own family, Syd must decide how to secure the survival of both settlements without tipping them over the brink to utter annihilation. In this intense and emotional reimagining of the Trojan War epic, two women clash when loyalty, identity, community, and family are all put to the ultimate test. Camille Griep, interview, New Charity Blues.